Struggling airline Amsterdam Airlines has grounded its flights and announced it will be laying off all staff with immediate effect. In a memo to staff, managing director Jaap Horsten said the company was ceasing its operations “due to extraordinary circumstances”. 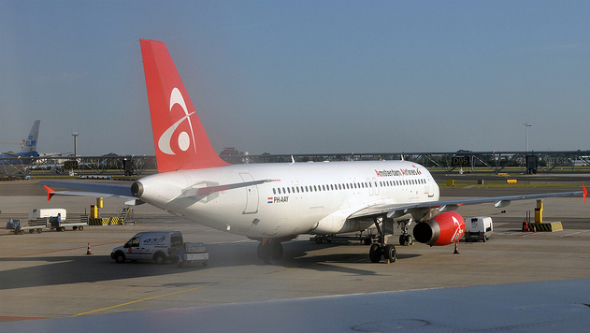 The airline, which ran charter flights mainly to Turkey and Morocco, had lost business during the financial downturn and had come under increased scrutiny from the Dutch Transport and Water Management Inspectorate (IVW), which regulates air safety. The IVW suspended the company’s licence to operate flights on learning of the announcement. The company must now either resume its operations within three months or permanently lose its authorisation from the IWV. It must also show evidence of financial security and its ability to comply with safety regulations. Based at Schiphol airport, Amsterdam Airlines started in 2008 and operated three Airbus A320 planes. As well as operating charter flights it transported military personnel from Scandinavia to Afghanistan.